Socialist Party :: Young people - fight for your rights! Fed up with bullying bosses, long hours and unsafe working conditions? As young people, we very often end up in low-paid shop, bar, catering or factory work. Often these jobs are casual or part-time in unsafe conditions. Top Shop boss Philip Green pays himself £1.17 billion tax-free and gets a knighthood. It would take a 16-year-old on the minimum wage working in one of his shops almost 200,000 years to earn that much. This huge inequality is unsurprising in a world where 24% of global wealth is controlled by just 0.01% of the population. Young people often bear the brunt of the growing exploitation required to sweat out these huge profits. But that is only one side of the story. 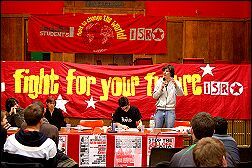 In this feature young members of the Socialist Party and of International Socialist Resistance (ISR) describe their experiences of a system that puts profit before any other consideration, and what they intend to do about it. Young people have been at the forefront of fighting attacks on education and working rights in Chile, France, Greece and many other countries. The same profit-lust that has driven young people across the world to stand up and fight back, will force young people in Britain to say enough is enough. We have to fight for our future. ISR is launching a campaign for the immediate end to the lower rates of pay for young people and to raise the minimum from a poverty wage to a living wage. We want to work with the trade unions and with unorganised workers. We want to organise meetings in colleges and universities to introduce the Know your rights campaign and link up with young people across the country who are ready to make a stand against what is seen by the fat-cats as a right to make millions off our backs. Replace the job agencies with a publicly run and funded service that serves the job seeker not the greed seekers. For the trade unions to organise agency workers against cuts, privatisation and low pay. For the trade unions to fight for secure, well-paid contracts and the end to 'McJobs'. The immediate introduction of the current trade union minimum wage, such as the UNISON demand for £6.50 an hour, as a step towards a minimum of £8.00 an hour for all, the EU decency threshold. The right to a job, training and free quality education. No to university top-up fees. For a living grant for all. A £60 a week Education Maintenance Allowance for all FE students as a step towards a living income for all students. Scrap the New Deal for young people, job seekers allowance and welfare to work. For full benefits without compulsion. "It does seem unfair that I earn £1 an hour more than my girlfriend just because she's a year younger than me, especially when we do exactly the same job." This was the response of one young supermarket worker when I spoke to him about the inequalities in the national minimum wage. We know that the adult minimum wage of £5.05 an hour is not nearly high enough and this is why ISR and the Socialist Party campaign for an immediate increase to £8 an hour. But when we look at the minimum wage for workers under the age of 22 we are doubly appalled at the poverty pay that young people are being forced to live on under New Labour. For 18-21 year olds, the minimum wage is only £4.25, and under-18s receive just £3 for every hour they work - this hasn't been raised since it was introduced two years ago. The Department of Trade and Industry is now trying to get these youth rates exempted from the EU anti-age discrimination directive later this year. This legislation means that workers doing the same job are paid the same wage regardless of their age, but the government doesn't want to deprive its big-business friends of the cheap labour that young people can provide. A recent survey initiated by the Mayor of London's Low Pay Unit concluded that there is a 'poverty threshold wage' of £5.80 an hour for people living in the capital. This is a very low estimate as to what people need to have a decent standard of living in London and 16 and 17-year-olds on the minimum wage in the capital are only earning just over half of that! The government's response is to claim that young people don't need to earn as much as older workers because they can rely on their families to assist them with necessities like food, rent, bills etc. This suggestion - that young people just work for 'pin money' - is a smack in the face for the thousands of working-class young people whose lives do not conform to such a sanitised and patronising view. The government accepts that people can leave home at 16, but not that money is needed to do this. But even those who do remain at home often can't rely on their families for support for the simple reason that their parents earn hardly enough to support themselves. The New Labour government argues that a higher minimum wage would mean more young people dropping out of education at 16 in order to work. This is typical of its negative approach to young people - they try to suggest that it's the lure of the money available in full-time work that prevents young people from continuing in education! But young people who do decide to educate themselves after 16 are punished for it. 16 and 17-year-olds may be entitled to £3 per hour, but those taking part in traineeships or modern apprenticeships are not even entitled to this amount. This means that many young workers are taking home less than £50 for a week of full-time work. A recent UNISON report calculated the average completion rate of such schemes to be only 27%. Another problem with modern apprenticeships and trainee courses is the lack of information and opportunity available to young workers after they have completed their course. It operates similarly to the "indentured labour" scheme of the past - young apprentices were employed for several years on low pay and then sacked when their apprenticeship was finished, instead of being offered higher paid jobs. They were sacked to make way for another layer of young workers and left their apprenticeships under-qualified and often unemployed. We, in ISR and the Socialist Party are demanding "Equal pay for equal work" and are linking up and campaigning with young workers who are suffering the effects of this discrimination. As socialists, however, we cannot afford to isolate this issue from the wider problems of capitalist society, where working-class people, young and old, are treated merely as cheap labour and where the human needs of the many are disregarded in the interest of the few. An estimated 700,000 workers are now sitting on the books of employment agencies in Britain and most are under the age of 26. Especially in the semi- and unskilled sectors there are many agency workers who receive no sick pay, work pension, protection from unfair dismissal, or training and are often paid less than permanent colleagues doing similar work. The numbers of young workers resorting to an agency to find work has sky rocketed over the last decade. The collapse of manufacturing industry, coupled with constant cuts in the Department for Work and Pensions, has meant that, in some areas of the country, agencies now have a virtual monopoly on the job market. In Stoke, the number of job agencies has more than doubled over the last five years. Many workers literally have no choice but to turn to casual work. The conditions these workers face are often straight out of the 1930s. It was the norm then for workers to line up in front of the 'labour master' and wait to be picked for their day's work. Once in work the situation isn't much better. I recently spoke to a young agency worker called Alex who explained how he'd spend ten hours a day sharpening metal spikes with a machine which really was out of the 1930s! It would leak what looked like toxic waste, all over him, all the time, meaning he'd have to spend most of his dinner hour trying to scrub the stuff off his hands and face. For that he was paid £3 an hour and was only paid for seven of the hours he had worked. Investigations by the TUC have shown that a number of agencies routinely make deductions from temporary workers for cashing pay cheques, transport, accommodation and providing clothing and safety equipment. This brings the hourly rate for many agency workers to below the current minimum poverty wage. The reports also show that those most affected are young people and migrant workers. Temporary workers do have some legal protection but are usually in too vulnerable a position, dependent on the agency for work and unaware of their rights or the role of a trade union, to effectively fight back. Employment agencies are well aware of this and often discourage employees from joining a trade union. It is urgent that the unions step up their work amongst agency workers - they are angry and many are ready to fight back. It's the role of socialists in and outside the trade unions to make sure that young workers on temporary contracts are encouraged to organise. "We don't give full-time jobs on checkouts be-cause it's just too boring and we don't want you going brain-dead!" Yeah right. When you ask for a full-time job on the checkouts in Tesco what they really mean to say is: "Although we made £2.2 billion in profits last year we don't give full-time jobs because we don't want to pay national insurance contributions for you". Cardiff The fact is it's very hard to get full-time work anywhere in retail as a part-time, skint workforce is all the more compliant and flexible to the employers' needs. From major understaffing in Woolworths, to a nightmare sequence of split-shift patterns in 24-hour Spars or Tescos - with the 3% absence-and-you're-out sickness policy (SYA-Supporting Your Attendance, better known as 'Sacking Your Assistant'), every company has its slave-driving tactics. What can motivate a young shopworker to feel that we can change company policy and that there's more to work than dreaming of pay day? The only answer can be a fighting union and there is no doubt that more than in any sector (along with catering) there is more than enough to be angry about. The European decency threshold, which is based on 68% of the average adult earnings is £275.60 a week, yet sales and retail assistants' earnings are well below at £244.95 for men and £218.85 for women. Average earnings increases for retail are 1.6% while average earnings increases generally stand at 3.8%. And these figures don't even touch on the inequality faced by retail workers earning below the adult rate. All this during a major boom period for the shopping giants. This of course makes low pay and rights at work the biggest campaigning issues for ISR and we can use it as the best recruiting agent of young workers to unions. Out of 2.6 million retail workers only a tiny percentage are in trade unions (the biggest retail union USDAW has only 340,000 members), but with the right strategy large numbers of young workers in particular can be unionised. Along with ISR's Know your rights and Low pay No way! campaigns, this could hugely improve their understanding of how they can fight back. In some stores, where we have 80% staff turnover, the reality is that the majority of young workers, a third of the workforce, don't know what a trade union is. This is hardly a surprise when their union has spent a large part of the last twenty years literally marketing itself as an insurance policy! Can the unions fight effectively for young workers? In the last five years, the union leadership, concerned that the drop in numbers joining will hit the union's finances, have decided to adopt 'the organising model'. This means turning the union into a campaigning union and attracting new members on the basis, not of the service you provide, but by organising stores so that members play an active part and turn the union into their own. This idea, dubbed 'new unionism' (in reference to the beginning of the formation of the union movement), is of course the only way a union can particularly attract young people, who will not automatically join as in the past. In practice, USDAW's national policies of class collaboration and partnership with its biggest wealth earner, Tesco, means that any organising model is strictly superficial as a union without teeth can't effectively campaign on anything. This is why it is so important for new blood to turn the union around. USDAW's main campaign at the moment is against the extension of opening hours for Sunday trading. This is a big issue as, in the eyes of most workers, it is linked to the deregulation of Sunday working - in particular the erosion of hourly premium entitlements. Of course the union cynically uses the campaign as a recruitment tool knowing that the extension of hours has already been agreed in a meeting of John Hannet, USDAW secretary, Blair and Tesco's Terry Leahy. However it is through recruiting young workers on the basis of giving a lead on this campaign that the real and urgent need for a fighting union becomes clear. Although small, there is a number of active young reps genuinely building the campaign by collecting petitions and appealing to other young members to join the youth committees and fight for Sunday double-time for all. Linking up the issues of low pay and union campaigns such as this paves the way for a new generation of shopworkers to gain a voice and transform our unions into genuine mass forces for change. ISR are calling a weekend of action, to fight for equal pay for equal work, but also for a wage that allows people a decent standard of living that's earned through hard work. We have produced leaflets, Know your rights at work cards, low pay packs and petitions demanding an increase in the minimum wages for young workers. We will be collecting the petitions in order to show support for the campaign, and we are planning to hand them into the Labour Party conference in Manchester in September to show Blair and Brown what young people really think, and the massive opposition to their divisive and unfair policies. Use the petitions to collect signatures and hand out leaflets explaining the campaign. Have a 'Wall of Shame' (see left) for young workers to highlight the lowest paying bosses. 'Out' the biggest Scrooge by leafleting and campaigning outside the workplace - do a press release to advertise what you are going to do. Leaflet young workers with our Know your rights at work cards, explaining their rights at work and the importance of trade unions. Organise public meetings on the issues of low pay, linked in with this campaign and other campaigns that ISR are involved in. 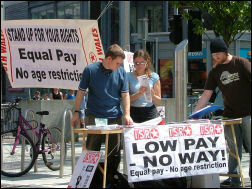 Encourage interested people to buy the ISR Low pay - no way! campaigning pack, for 50p. Have regular campaigning stalls, featuring the leaflets, cards, petitions, campaign packs, the ISR magazine Socialist Youth and the socialist, as well as other material that people might be interested in. Organise an ISR group in your area if there isn't one already. Contact us for more details.